WEST WINDSOR – During an early season warm up at the Snowbird Classic in Myrtle Beach, S.C., the Mercer County Community College (MCCC) softball team saw the passage of a milestone with the 400th career win of MCCC Head Coach Ryan Zegarski. And the team came through in fine form for that 400th victory, with an 18-1 win over Onondaga, N.Y. The team wrapped up the week-long tournament with a 7-2-1 record. Now in his 14th year as head coach, Zegarski has a record of 401-157-1 for a .717 winning percentage. He has twice led the Vikings to the National Junior College Athletic Association (NJCAA) Division II World Series. His 2016 squad set an MCCC record for wins, finishing 41-9. 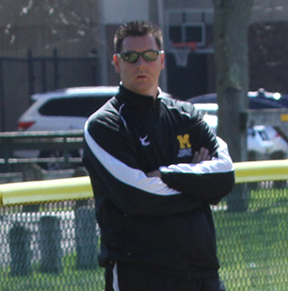 Zegarski played baseball at MCCC and was part of the 2000 team that reached the NJCAA Division II World Series. Zegarski continued his playing career at Richard Stockton University, where led the New Jersey Athletic Conference with a .455 batting average in his junior year. Zegarski is assisted by Tom DeStefano and John Simone.